ExtraHop with a bold vision: transform the scale and complexity of modern IT into a powerful source of intelligence for business operations. That vision is why ExtraHop is now the leader in real-time IT Analytics. We're the first place IT leaders turn for the accurate and timely insight that enables their teams to reduce risk and task data-driven action. 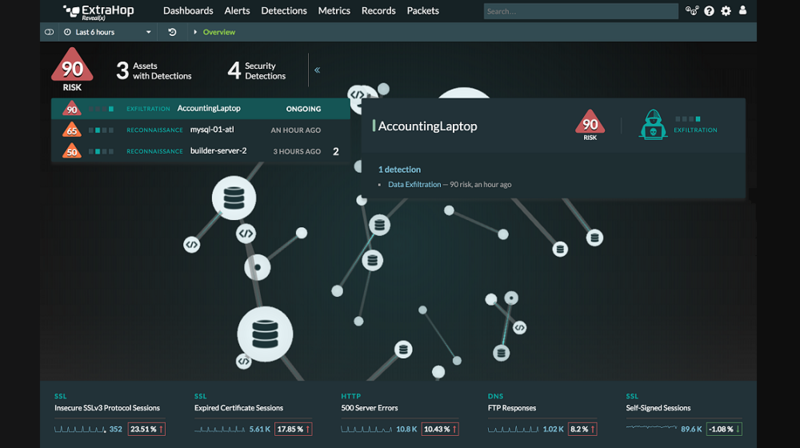 A new source of insight is required for modern security programs, one that provides empirical evidence to help analysts triage and investigate threats with confidence and timeliness.ExtraHop Reveal(x) provides crucial insights and automates investigations so security teams can focus on what matters. ExtraHop Reveal(x) uses real-time stream processing to automatically discover and classify every transaction, flow, session, device, and asset in your enterprise, including data centers, cloud-hosted applications, remote branches, and IoT. Using the richest data source available, your network, ExtraHop Reveal(x) provides the fast, high fidelity insights about your internal (east-west) environment that are crucial to successful security operations. ExtraHop Reveal(x) automatically detects and classifies everything communicating on the network, making it simple to identify and focus on securing critical assets in any environment. Reveal(x) machine learning monitors those critical assets for any changes, alerting on key events with the full context and evidence you need to investigate with confidence. AI is only as powerful as the data you give it. Wire data from ExtraHop provides unmatched internal visibility, including into east-west and encrypted traffic. Using always-on machine learning on wire data in real time allows ExtraHop Reveal(x) to surface real threats and suspicious patterns with higher fidelity than any other solution.